A while ago I made a turkey pho using some homemade turkey stock and leftover turkey and I really enjoyed it. 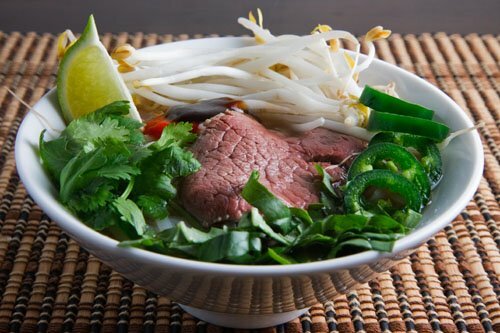 Pho is a Vietnamese rice noodle dish with a broth flavoured with star anise. The classical pho is made in a beef broth and is served with beef. Ever since I made the turkey pho I had been wanting to try making the traditional beef pho (or pho bo) from scratch. I started looking for a recipe in my bookmarks and the one that caught my attention was the one for pho bo on eatingclub vancouver . From there I amalgamated what I liked from a few different recipes to come up with this one. The first step was to make the broth which required simmering beef bones for several hours. Luckily I was able to find the beef bones pretty cheap at a local butchers shop. This recipe calls for 2 cuts of beef in addition to the bones. The first cut of beef is a cheap cut that is simmered in the broth until it is falling apart tender. This adds even more flavour to the broth and then the braised beef goes into the final soup as well. The beef broth is also made with the star of the show, the star anise, and cloves, cinnamon, charred onions and ginger, fish sauce and sugar. Just with that list of ingredients it is sounding really tasty! Nice and beefy and sweet and salty and star anise’y with a hint of spices. Once the broth is ready you are just about done; all that is left is to cook the rice noodles and assemble the soup. To assemble the soup, you place the braised beef in a bowl and top it with the cooked rice noodles followed by the second cut of beef, which is thinly sliced, along with the bean sprouts. The broth is brought to a boil and poured over the beef and beansprouts into the bowl. The boiling broth just ‘cooks’ the thinly sliced beef and blanches the beansprouts right in the bowl. Because you are just barely cooking the thinly sliced beef you will probably want a really nice and tender cut of beef like a tenderloin. Next you throw on your condiments such as basil, cilantro, jalapenos, hoisin sauce and chili sauce. The pho bo broth took a bit of work and time to make but it was well worth it! It was nice and tasty and I really enjoyed the star anise flavour in a savoury dish like this. Other than the star anise, what I liked most about this soup was that it was nice and light and with all of the topping is was fresh and summery. The thinly sliced ‘raw’ beef on top was just perfectly cooked and nice and juicy and tender. What a great soup to enjoy on a cold winter day! Luckily I have leftovers so I will get to enjoy it for a few more days! Place the bones into a large stock pot and bring to a roiling bowl for a few minutes. Drain the water, rinse the bones and the pot and fill with clean water. Add the beef, onion, ginger, star anise, cloves, cinnamon, peppercorns, fish sauce and sugar and simmer for 2 hours. Remove the beef and continue to simmer for another 2 hours. Strain the solids from the broth and season the broth to taste with fish sauce and sugar. Shred the beef that was simmered in the broth and divide between 4 large bowls. Divide the noodles between the bowls along with the beansprouts and place a few slices of the raw beef on top. Garnish with the basil, cilantro, jalapeno peppers, lime slices, hoisin sauce and chili sauce. Tip: You can char the onion and ginger directly on the flame of a gas stove or under the broiler. Now this is a soup that can satisfy any hungry appetite! I love all the Pho. I could eat the broth every day. It looks so delicious Kevin. DId you know that this is my very favorite soup? This looks super delicious, fresh and healthy! I love it! Your food turns out like art! I love pho!!! They tasted so good especially during rainy days. I’ve never made pho, and it’s been way too long since I’ve eaten it. Looks great! I am sure a big cooking project like this will take lots of work! So cool to have great leftovers! Love it! Great job Kevin! Ill be honest Ive never had anything like this! Looks great! I love all of this pan-asian food! In Seattle pho is huge!!! Beautiful dish, Kevin! Pho Bo is one of my absolute faves. In fact,I had a big bowl last night! Mmmm … yummy Pho Bo! Looks great! Viet-town this weekend for ingredients –> Pho Bo! Thanks for the recipe, I'll try it sometime during the next week. Oh my god, that looks soooo amazing. How wonderful! Thanks for sharing the recipe! Can you believe that my sister and I will go to “Pho” restaurant once a week just have this soup? yep, we both like it so much. Yours look so delicious too. Your soup looks delicious Kevin, but then again, everything you make does! I love pho!! I just had a bowl last weekend. Looks delicious! OH yum, good job for making Pho at home, its quite a task I’ve heard! This is something that I have always wanted to make. Yours looks so delicious! Do you know I’ve never had pho?? Embarrassing admission, I know…! I love the idea of meat in a broth flavoured with star anise though 🙂 Beautiful dish too. I know it has a lot of ingredients, but it seems pretty doable! Your picture looks awesome! I’ve only had Pho Bo once and I really loved it. Your version looks and sounds really tasty. I love pho! Your version looks especially tasty! I am pleased to see you make it the same way I do, which is authentic, I learned from my Viet sister! Go Kevin! Your pho bo looks so so so good. At home I make chicken pho because it is simplier. Star anise makes all the difference! I want to go home and have a big bowl of noodles right now. It’s so cold outside. holy hanna!!! that looks amazing Kevin!!! Wow, this is one of my favorite soups…I try to buy one as much as I can…but I would LOVE to try this…bravo! I would definitely follow this blog… if you installed the gadget. This looks more like dinner in a bowl than soup, and a mighty fine dinner, at that! It is a soup time of year. 15 degrees again here in Washington DC. I like the idea of a big squeeze of lime all over it too! one of my top five foods. yours looks fabulous. Your bowl of pho looks fabulous, Kevin! Want some now. wow!! Kevin your pho bo soup look better than the one sell in the restaurant !! great job!! I love this dish and never realized the broth contained star anise. This looks absolutely delicious. Thanks for this recipe. This looks good. I cant believe Iv yet to go to any of the vietnamese restaurant here. The last time I had these was back home in Malaysia in 03. Maybe I should try make these myself. Great Pho Bo Kevin. Your dishes always look so tempting…. yums! I’ve made lots of pho, but your recipe has more ingredients. I think I will give it a try! Thanks Kevin, now i did very well. If someday you come to Vietnam, contact to me : thienthaohotel@yahoo.com, i will lead you go to the best of "Pho" and Vietnamese foods. Looks great, though I'm confused about steps 1 and 2. You boil the bones for a few minutes, then throw out that water and refill the pot with clean water? Do the bones go back into the 2nd pot of water? JCarson: Yes, the bones stay in the pot after the first boil. The first boil helps to ensure that you have clean bones and that nothing is present that may put off the beef flavour. I must have to try preparing this one!! very delicious..i already made it yesterday and I am planning to make it tomorrow..because its very delicious..i like the tasted on it.. I would love to make this for my partner, Pho is one of his favorite foods, but he is allergic to fish. Can the fish sauce be left out? Or are there any good substitutes for it? Cate Fisher: Soy sauce would be a good alternative to the fish sauce, otherwise salt to taste. Enjoy!